UNITED NATIONS, July 22 -- Forty days after the Economist rated UN Secretary General Ban Ki-moon a mere two out of ten on management, his Under Secretary General for Management Angela Kane told the Press she didn't know the maximum prohibition which the UN could have imposed on Siemens AG, which pled guilty to corruption. She said didn't know the specifics or public availability of UN gardening contract she'd said had been amended due to the replacement of garden space by the UN's new temporary building. In a school one might say, this is not how grades are improved. 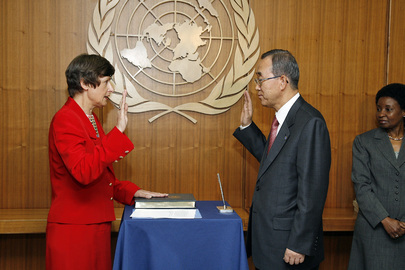 When Inner City Press first sought to ask Ms. Kane at her July 22 briefing about the controversy surrounding the UN's lesser six month penalty to Siemens AG than the two year ban imposed by the World Bank, "keep it to smoking" was the reply from moderator Marie Okabe of the UN Spokesperson's Office. Video here, from Minute 29:30. Ms. Kane's appearance, the first since May 21 and since the low Economist management rating, was supposed to be about cigarette smoking inside the UN. On the Siemens case, the UN Spokesperson's Office, seemingly on behalf of Ms. Kane, had written to Inner City Press on July 11 demanding that corrections of "factual errors" about the Siemens penalties in ICP's original July 7 story be published. But on July 22, Ms. Kane was unable to identify any errors. Inner City Press asked if the UN and World Bank applied different standards to the same guilty pleas by Siemens to corruption. It's "not a matter of standards," Ms. Kane said. 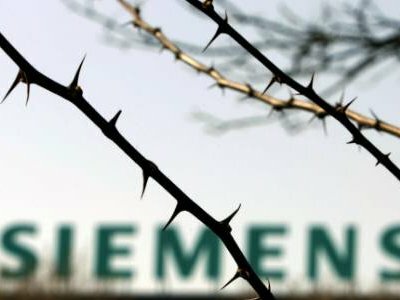 Since the World Bank has banned Siemens for two years, Inner City Press asked if six months prohibition was the maximum the UN could impose. Ms. Kane, who had demanded correction of errors and even sought to target Inner City Press and two other media organizations for not running corrections, said, "I don't know." Video here, from Minute 36:50. "The Director, UN/PD, or CPO as appropriate, shall decide whether to remove, or suspend from the Vendor database and notify the Vendor accordingly. The notice shall advise the Vendor of the United Nation’s decision to suspend for a specific period of time, or remove indefinitely the Vendor from the Vendor database and specify the reasons for the decision." So, despite Inner City Press having asked the question at a UN noon briefing before writing, and then having published in full a "correction" by Angela Kane, the question remains: why did the UN impose only a six months ban for the same Siemens facts which triggered a two year prohibition by the World Bank? That the response to this question, rather than an answer or improvement, is to demand corrections of the analysis that the UN does not take corruption seriously enough may be one of the reasons for the UN's and Ban's low grades. The UN's National Competitive Exam, a merit-based way to enter UN employment, was recently suspended. Member states and others complained, Inner City Press asked and wrote about it. On July 22, Ms. Kane gave another lengthy answer -- video here, from Minute 43:18 -- but still the question has not been answered: if the NCE needed improvement, why not fix it while continuing this one meritocratic entry point? In the interest of transparency, Inner City Press is putting online here an internal UN e-mail on this topic, setting out a calendar for the NCE and the G to P promotion exam, also suspended, both purportedly to be resumed in 2010, provided by a whistleblower. Ms. Kane was asked about whistleblowers, and replied that she was not aware of any complaints. Video here, from Minute 43:18. Inner City Press asked about the sample case of a UN Development Program whistleblower, whom UN Ethics Officer Robert Benson recommended be paid back wages for due process violations. Has the UN followed up, since the continuing non-payment sends the message that even those whistleblowers who persevere and obtain a recommendation of back wages in fact receive nothing? Ms. Kane said this is outside of her remit, to ask UNDP or Mr. Benson. But neither has taken questions in the UN briefing room for many months. Ms. Kane was not asked about her role in the current plan to move UN correspondents from offices with doors and walls which whisteblowers can visit and call to open offices with no doors, the so-called "No Whistleblower Zone" which along with Kane's targeting of three media organizations gave rise to a Dear Colleague letter in the U.S. Congress. Ms. Kane's complaint ostensibly was that the media organization don't run her "corrections" (see above). Who is making the UN look bad? While Ms. Kane demanded a correction about the UN's contract for gardening on the North Lawn, now largely occupied by a new temporary building, when Inner City Press asked Ms. Kane how much the contact was reduced by, she said, "I don't that number." Is it in the UN Procurement database? "I don't scroll the data base," Ms. Kane said. This is the type of defensiveness and lack of transparency for which this UN is becoming known. Or is that analysis a "factual inaccuracy" for which correction will be demanded?